At Aqualife, maintaining quality at the highest level is the most integral aspect. Towards this end, we have rigorous quality control checks that ensure all the requisite standards are adhered to. Our Quality Management Systems have been certified with the ISO 9001 – 2000, HACCP & ISO 22000:2005 Certified Company . These are just a couple of testifying factors to the dedication we have towards quality. 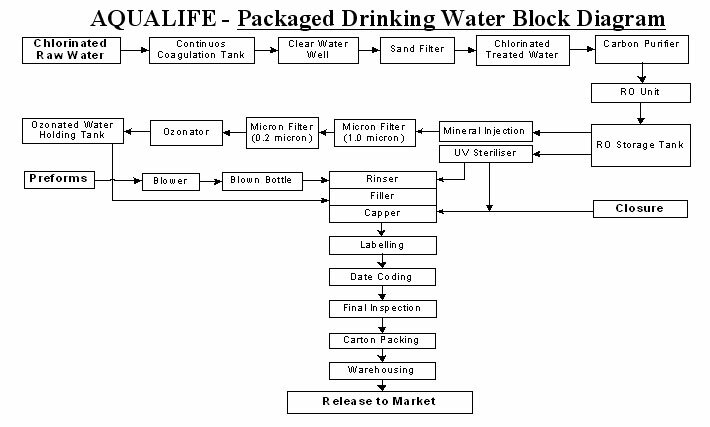 Chlorination is the world-wide accepted technique for water purification. It disinfects water from the micro-organisms. Coagulation is one of the most accepted conventional method of water treatment to reduce alkalinity , hardness, suspended and dissolved impurities. Previously oxidised,coagulated & flocculated impurities in water are finally trapped in the filter media and clear filtered water free of heavy metals and organic matter is released downstream. Removes all suspended impurities and colloidal matter, yields a turbidity of less than 0.5 NTU. MS internally food grade epoxy coated. Filter media is inert, acid washed to remove all organic matter. Backwash Flow rate for efficient cleaning of the filter bed is 6 times the forward flow rate. Functions in two distinct processes of Adsorption and Catalysis. Removes free chlorine and dissolved organic matter ( pesticides). Removes off odors like ammonia, hydrogen sulfide etc. Removes color and off taste causing elements. « Mesh size 12 x 40. « PH in the range 5-8. « Molasses No : Min 200. Backwash Flow rate for efficient cleaning of the filter bed is 2-3 times the forward flow rate. Micron filtration is a 5 stage filtration which remove contaminates from water by pas sign through a series of micro-porous filters having pore size 20, 10, 5, 2, & 1 micron. Reverse Osmosis (RO) is the tightest possible membrane process in liquid/liquid separation. Water is in principle the only material passing through the membrane; essentially all dissolved and suspended material are rejected. Ensured to an ultra purity level of less than 100 TDS. RO membranes are procured from world renowned manufacturers DOW ,OSMONICS & HYDRANAUTICS. « Cartridge Filter to remove particulates. « High pressure pump to develop the required pressure. « A set of membranes housed in pressure vessels. The tank capacity is so designed to give at least 6 to 8 minutes contact time at 1-2 ppm residual ozone. U.V rays act as a powerful sterilizing agent. It destroy bacteria, viruses or other microbiological contaminants present in water, eliminating the possibility of any water born diseases.